Pedestrians will soon have more options in Barcelona. Air pollution, noise, and pedestrian accidents plague Barcelona. Like many modern urban areas, the Spanish city has consistently failed to meet air quality standards set by the World Health Organization, and studies attribute more than 3,500 deaths per year in Barcelona to the city’s polluted air. High noise levels from traffic and tourists, as well as scores of pedestrian injuries and deaths, have pushed city officials to create a bold plan they hope will set an example for the rest of the world. 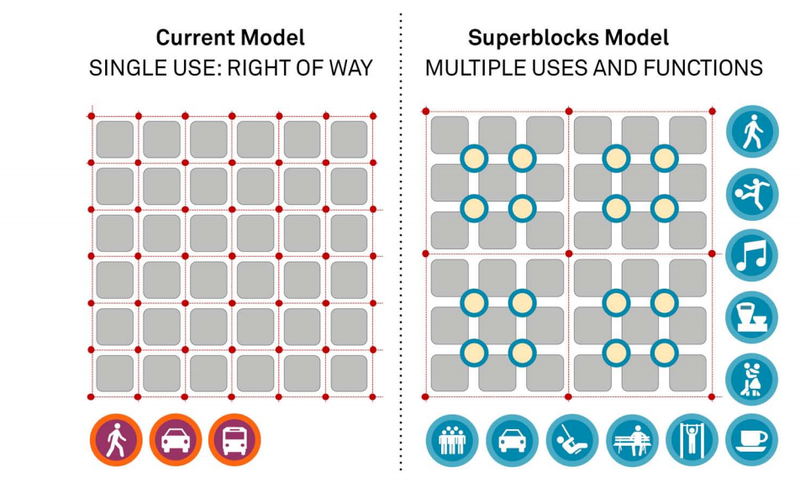 “Superblocks” are at the core of the new plan, which was first outlined in a 102-page report in 2014. By limiting cars and buses to main thoroughfares in the city, urban planners are hoping to encourage people to walk and bicycle more than they do now. Barcelona will add 200 km (124 miles) of bike path to the city’s current total of 100 km (62 miles), and will reroute busses so that all residents have a bus stop within 250 meters of their home. Barcelona’s “Urban Mobility Plan” will be implemented in phases, and starts by targeting the most congested neighborhoods. 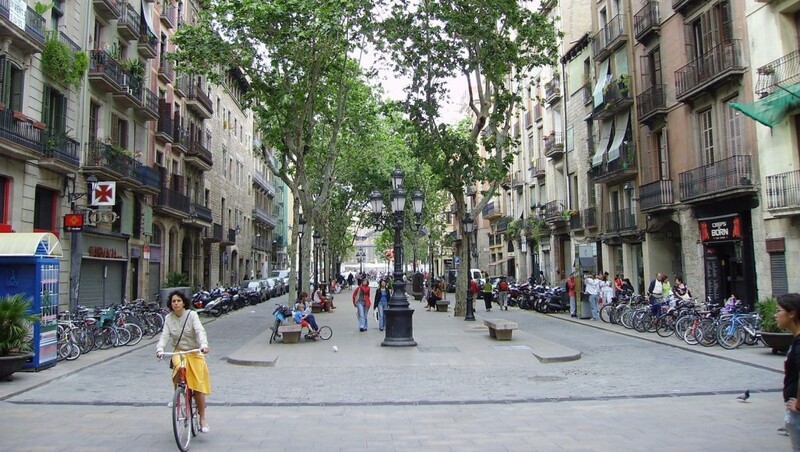 The Eixample neighborhood, which was built in the mid-1800s to relieve the density of the overcrowded Old City, will be the first to adopt superblocks, according to The Guardian. The neighborhood has only 1.85 square meters of green space per inhabitant, far below the WHO’s suggestion of 9 square meters (97 square feet), while the rest of Barcelona has only 6.6 square meters (71 square feet) of green space per inhabitant, on average. 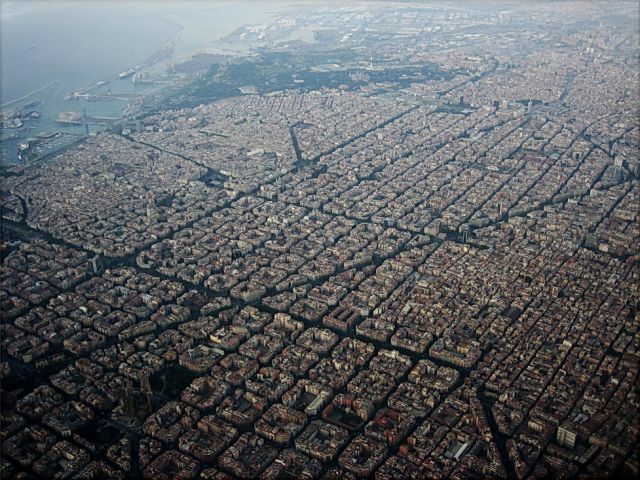 Eixample, which literally means “expansion,” is composed of distinctive octagonal blocks. Nine of these blocks, housing 5,000 to 6,000 people total, will make up one superblock in the city’s new plan. The internal intersections, devoid of cars, will become municipal squares. Each superblock will contain 160 of these squares, which will add a lot of green space. ‘Incineradoras No, Zero Waste Madrid’ in action! Incineradoras No, Zero Waste Madrid is successfully paving the way for Zero Waste Municipalities in the area of Madrid, in Spain. Since this summer, thanks to the progressive political turn in many municipalities in the area, the network has been able to ally with alternative political parties and pass a motion in at least 4 municipalities calling for zero waste. Moreover, the network has been able to create and develop working groups for the implementation of Zero Waste in various municipalities, as an alternative to the waste management model of municipal waste. The four municipalities that have already approved the motion are Loeches, Mejorada del Campo, Torres de la Alameda and Velilla de San Antonio. All of them are small municipalities no more than 44km2 and with no more than 23,000 inhabitants. However, they have a lot of environmental problems such as plants for the treatment of sludge from toxic materials, wastewater treatment, the deposit of industrial and dangerous waste, illegal landfills, incinerators and cement kilns burning waste. The approval of the motion brings positive news and hope to the current waste management situation in Madrid. It is a presents a step in the right direction on the way to a Zero Waste reality. The creation of a working committee to implement a zero waste model with the participation of local political and civil society groups. The council to be formally required to create a ‘regional waste strategy 2016-2026′ for the City of Madrid. This would replace the current and outdated strategy and set the objective of ‘Zero Waste’ waste management in our region..
An awareness raising campaign should be carried out with citizens participation, where people are informed about the current waste management practice, its impacts, the alternatives, and benefits involved such alternatives. A study of current and future costs of waste management if it were to be run by the municipality should be conducted. This study should assess its viability and implementation. A review of current waste management contracts and whether they can be modified, to allow a gradual implementation of a zero waste selective collection project. Control and monitoring of the current waste collection to ensure that contracts are enforced, so we would able to confirm that they are not mixing municipal waste and other types of waste (packaging) etc. in its collection. This Zero Waste Europe member is a network of neighborhood associations, environmental groups, Popular assemblies of 15M, collectives of organic gardens, organisations formed to fight facilities and harmful waste plans, “No Macro-Landfill, Yes Zero Waste” campaign, representatives of political groups and individual zero waste campaigners. Their common goal is the fight against the creation of hazardous waste, against harmful waste facilities and planned facilities primarily located in the Eastern region of Madrid. Over the years this network has been a focal point of resistance to environmental damage in the area. It works to submit refutations to waste projects, environmental damage reports, conducting lobbying and organising trainings, rallies and demonstrations aiming to show the popular opposition against these projects. While challenging these facilities, the network has developed, and now promotes an alternative Zero Waste policy to the current waste treatment plans. This should be implemented in all municipalities of the City of Madrid. In this way, Zero Waste Madrid also wants to reach the institutions through the current ‘popular unity’ candidates who are much more open to this project through motions in the municipalities where they are in office. In conclusion, thanks for the wonderful work of ‘Incineradoras No, Zero Waste Madrid’, zero waste is really happening in Madrid!